No You Don’t Need A Liver Cleanse! Not A Detox Program Either! As I’ve been preparing my mini course on the Liver I’ve been thinking back to some of the questions that come up during my lectures. You see, 95% of people who ask this question are not exposed to harsh daily environmental toxins, do not have some form of liver disease and live a relatively healthy lifestyle. Here’s what you can do right now – and it won’t cost you your first child or require some complex formulation of herbs from someone on the internet claiming you should buy their product or suffer death. Each of the following are equally important. 1. Move your body 45 minutes a day, every day. Your entire being requires you to move to keep everything lubed, happy (Exercise is more effective at managing mild depression than ANYTHING else.) and functioning properly. The lymphatic system works much better at returning fluid and waste when you move your body using your skeletal muscles. You then will deliver more blood to the liver when you increase your circulation. More blood to the liver means more blood to be filtered. Just move. 2. Sleep. Every night & whenever possible, sleep 8 hours. 100 years ago our ancestors were getting 9 1/2 hours of sleep per night. We have not evolved to a point of only needing the new average of 7 hours. No matter how hip it is to claim you can live on 5 hours per night, you can’t. This sleep deprivation causes many other health problems and for god sake, you are driving a 2-ton vehicle around! The liver performs its “night job” of filtering and detoxifying the blood while we are sleeping. During the day it is performing its other 499 tasks (or 30,000 depending on how you break it down. no kidding). 3. Eat more alive food; that is, food that was alive until you prepared it. Got your attention didn’t I? What do I mean? Eat fresh veggies! Buy them fresh and prepare them. Especially cruciferous veggies (broccoli, brussels sprouts, cabbage, cauliflower, collard greens, kale, kohlrabi, mustard, rutabaga, turnips, bok choy, chinese cabbage, arugula, horseradish, radish, wasabi, and watercress)! Eat all those foods you’ve heard are good for preventing cancer. They all supply necessary nutrients to the liver to use during its Phase I and Phase II detoxification (More on this in the mini course). Take a break from the behaviors you know are asking the liver to work harder. No, there’s nothing new here and I bet you could list them all right now before reading one more line. In general it’s eating and drinking things the liver has to detoxify: tobacco, alcohol, recreational and pharmaceutical drugs, (Pharmaceuticals need to be detoxified as well, but if you need them for health/living, please keep taking them. ), over-the-counter medications, essential oils (yes essential oils), coffee, entheogenic plants (Cannabis, Kratom, Psilocybe mushrooms, Ayahuasca, and any other entheogen plant I haven’t listed. Just because they are natural doesn’t mean the liver doesn’t have to break them down), Sugar. And yes, if you are over-consuming any sugar it’s too much. This includes: honey, maple syrup, organic cane juice, agave, fructose, table sugar, date sugar, palm sugar, baby jesus sugar, SUGAR! You don’t have to stop them forever, well maybe sugar, just take a break. See how you feel after a month of not using them. 5. Stop using High Fructose Corn Syrup. 6. Try some liver supporting herbs. I’m talking tea/infusion/decoction. Plain and simple herbs with water like our Grannies and their Grannies served them up. Be like the hip herbalists and carry your beverage around in a mason jar and drink it all day. One mason jar of tea is your daily dose. Nettle leaf: Let’s be clear, I love this plant and she will pretty much be my answer to almost anything you’re asking about. Ok, maybe not everything, but almost. Dandelion root: It might be too late to dig them yourself, but they are easy to find from your local herbalist. Some folks even roast them and make a coffee-like substance (beware it is NOT coffee and has ZERO caffeine. Not that I have any feelings about that.). Burdock Root: Yup, the same burdock whose seed head sticks all over your animals. Except we are looking to use the root. Again, you can find it at your local herb shop. You might even make a nice decoction of dandelion and burdock root together. This earthy blend is a gentle nudge to your liver and will help guide you back on the path of full liver wellness. 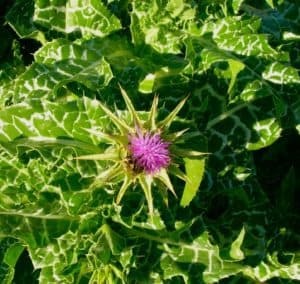 Milk Thistle Seed: Here’s the superstar of liver support. For our purposes here today, a low dose of the ground seed will take care of boosting the liver function. Higher doses are for folks with liver disease, on heavy duty pharmaceuticals and/or exposed to environmental toxins on a daily basis. Does Your Liver Want More? More details and juicy physiology will be forthcoming in my mini class on the liver, but for now I hope you are enjoying a nice cup of one of your liver supporting friends. *This discussion is for folks who want to gently nudge their liver into its fully functioning filtering capacity. It does not cover treatment for cirrhosis, fatty liver disease, or hepatitis.